We just got back from cruising the pits which I love doing. I love watching mechanics swarm over a motorcycle when it comes in off the track. The rider jumps off, starts talking to the crew chief, the bike goes up on the stands, if it is going back out the tyre warmers go on or new wheels put on, a technician hooks up a laptop computer to download the information from the bikes computer, evrything is checked over, everyone has their job, including the guy that polishes the bike. The rider going back out hasn’t even taken off his helmet and is surrounded by mechanics, tyre tech and a suspension tech. Controlled chaos…I love it. If the session is over or there is serious problem with the motorcycle it’s less chaotic, but not much. Computer tech plugs into the bike, wheels come off, bodywork comes off and work begins. The motorcycle looks a skeleton of itself. It’s a similar story if the practice session is over. The mechanics still swarm the motorcycle, the computer tech hooks into the bike instantly, wheels come off, bodywork comes off, mechanics are discecting every thing. The bike looks like a skeleton of itself. This time the riders helmet is off he get’s a chance to sit down and is surrounded by the crew. They analyze the data from the computer,they talk about feel and how to improve the bike. Debriefing they call it and it takes about twenty to thirty minutes. Mechanics are working away and and that’s when we in the media get a chance to talk to the rider about how things are going. This is a great job. 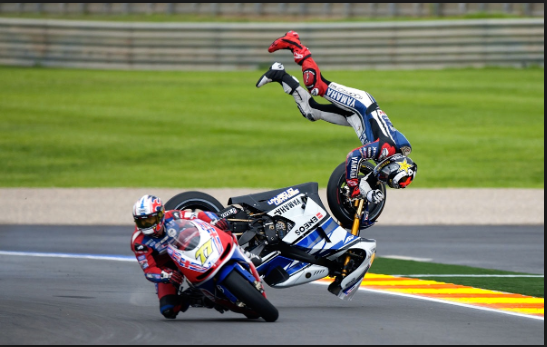 This entry was posted in Helmet Time and tagged carlos checa, motorcycle accidents, motorcycle racing, Noriyuki Haga, the motoworld podcast, world superbike on May 31, 2009 by themotoworld.